The R-PLEX Rat IL-5 Antibody Set includes a matched capture and detection antibody pair and calibrator for the quick and easy measurement of IL-5 in biological samples. R-PLEX products leverage MSD’s electrochemiluminescence technology for better sensitivity and a larger dynamic range than traditional ELISAs. R-PLEX matched antibody sets enable the development of singleplex and multiplex immunoassays. Individual assays may be developed using MSD avidin- or streptavidin-coated plates. Custom multiplex assays with any combination of R-PLEX analytes, as well as R-PLEX plus U-PLEX analytes, can be developed on U-PLEX MULTI-SPOT plates. To learn more about the advantages of R-PLEX products click here. 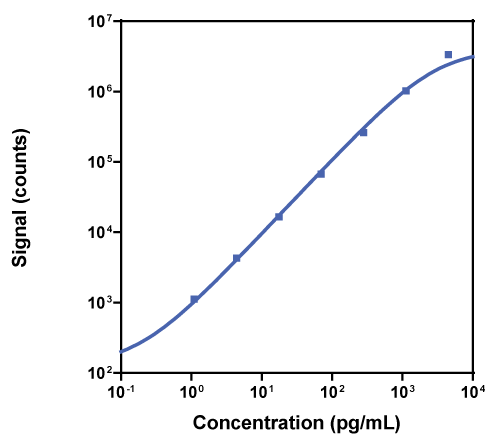 Calibration curve for the R-PLEX Rat IL-5 Antibody Set was assessed and representative data are presented below. Description - Interleukin-5 (IL-5, B-cell growth factor II, BCGF-II, T-cell replacing factor, TRF) is a glycosylated homodimer that is mainly produced by eosinophils and Th2 cells. It induces terminal differentiation of late-developing B cells to immunoglobulin-secreting cells. IL-5 binds to the α subunit of the receptor, which then associates with the βc subunit, yielding a high affinity interaction. IL-5 is associated with eosinophilia, atopic dermatitis, and pulmonary fibrosis along with other disorders. Anti-inflammatory cytokines, pro-fibrogenic chemokines and persistence of acute HCV infection. β-Defensin 2 and 3 promote the uptake of self or CpG DNA, enhance IFN-α production by human plasmacytoid dendritic cells, and promote inflammation. Correlation between cytokine levels and changes in fatigue and quality of life in patients with acute myeloid leukemia.